Sink on Left Eagle Group BEV3096SE-10BS Beverage Table - 96"
This Eagle Group BEV3096SE-10BS enclosed base beverage table is the perfect way to organize hot and cold beverage centers at server stations or in cafeteria type settings. It features a 10" high full length backsplash with a standard outlet for plugging in coffee brewers or cold beverage dispensers. Two sets of 3 stainless steel rack slides are designed to accommodate 20" wide glass racks and provide ample storage space for back up mugs, glassware, dinnerware, or trays. 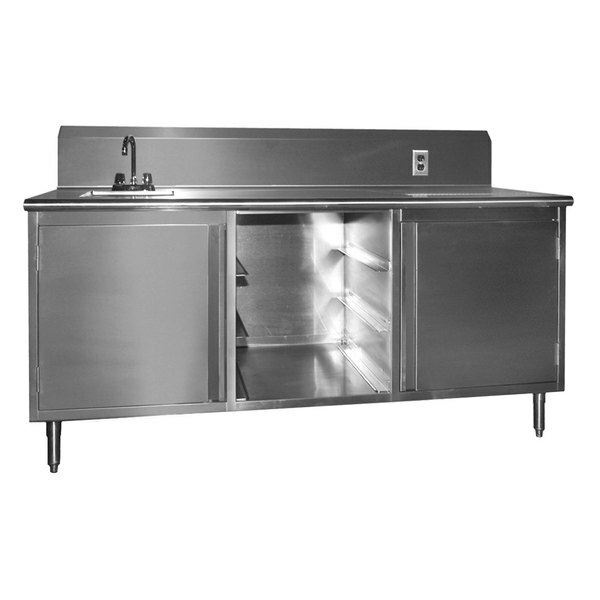 This beverage table's countertop, body, and hinged doors are made of heavy duty 14 gauge type 304 series stainless steel. The countertop is furnished with a sanitary 1 1/2" rolled front edge. It also includes a 10" x 14" x 9 1/2" sink bowl with a stainless steel 1 1/2" basket drain and #319247 faucet. Eagle Group BEV3096SE-10BS Beverage Table - 96"